So before I reveal the name, let’s talk about what the mission statement, vision, hope and dreams that this blog is. This blog is a safe space. I want to talk about life in a fat body. The struggles of the pressures to lose weight, to be happy, to be healthy mentally and physically. I want this to a be a place where teenage girls who are struggling to feel accepted or like they’ll never find love, or their place in the world, can come here and say “I can wear that. I can be that. I can love. I can live a full and happy life”. Growing up we didn’t have many role models that looked like us, and society painted a very specific picture of what was beautiful – and my size twelve frame at 10 years old didn’t fit that mold. I remember my first diet at a very young age. I was drinking Slim Fast before 10. My parents wanted me to be healthy, but in the midst of that love I developed a comfort in food instead of a healthy relationship of how to nourish my body. One of my deepest memories of self-hate was reading Seventeen magazine and flipping to the back where the classifieds were and this ad stuck out to me regarding ‘QUICK’ ‘FAST’ ‘WEIGHT LOSS” – those were the key words for a 14-year-old, right? I had no idea what I was going to get, but I scrounged up $25 in coins from around the house and put them in an envelope and wrote the address down. A few weeks later my parents confronted me about an envelope of coins being sent for diet pills, because surprise, you can’t ship an envelope of coins without a stamp. It was mortifying. It was degrading, but what I needed was a conversation about why I felt I had to do something like that. And instead I felt shame. It took years to feel 95% comfortable in this body. 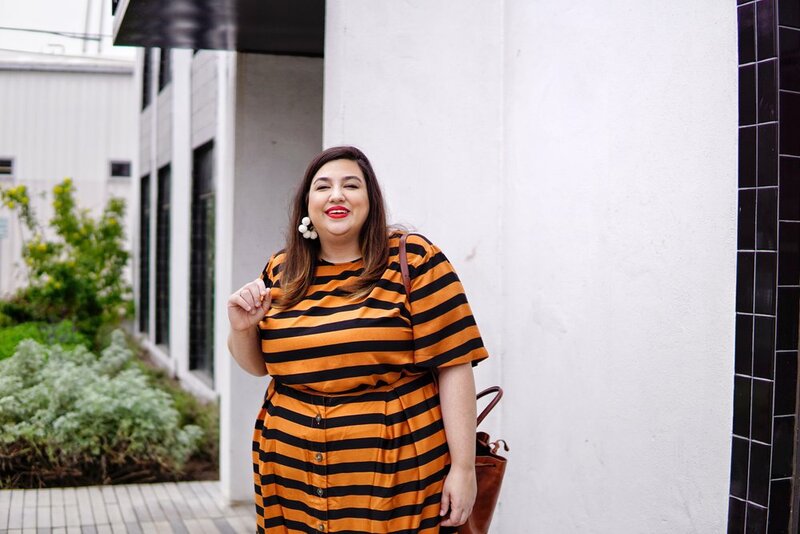 I don’t know if I’ll ever be a 100%, but it wasn’t until a few years ago that the internet opened up the world of #BodyPositivity, #Fatshion, #Fatkinis – and this radical self love started to change my core. I started to wear what I wanted, and what I wanted was bold and bright, and I was soon known as stylish and different, and I was becoming a woman I never thought I could be. The internet has brought us strangers who aren’t so strange, who have the same bodies as us; They are beautiful, successful, loved and … fat. And a word I had been so scared of is now something that just is: Fat, because we all have tummies, we all feel things about those tummies, and big or small, your tummy is yours. So I’m packing up Mint Society in the most beautiful box and will tuck away with my most cherished memories, because Mint Society doesn’t encompass all I want to share and do for this community. But @tummysociety does. Tummy Society is a safe space for all tummies. No matter where you are on your journey of self love and acceptance, how big or small or your tummy is, Tummy Society is for everyone. I will be transparent about the challenges, wins, and accomplishments in a plus size body. But even if your not plus size, i hope to connect with style and interest because Tummy Society is for all tummies.